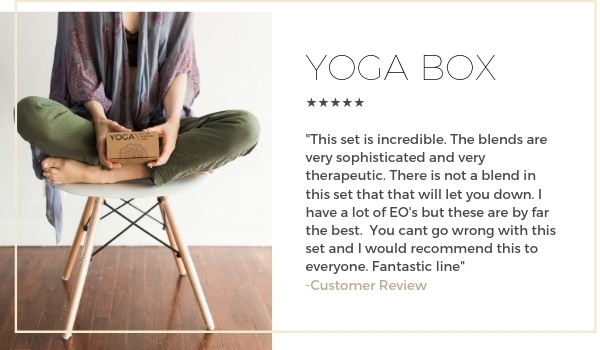 This box set is the perfect gift for the everyday yogi. and a convenient kraft gift box for presentation and portability. Promote Tranquility, Pure Bliss, Mind, Respect, and Presence with this Jade Bloom Exclusive Yoga Blend Pack. This box set is not only a great way to add to your Jade Bloom Oil collection but also makes a great gift for the Yogi in your life. I ordered this not knowing what to expect. Ended up loving all of the blends! Like everything from Jade Bloom: a wonderful set. Yoga and meditation sessions just got a lot better with the scent of the Yoga Blend. The fragrances transport you right there where you wish to be when practicing your favorite relaxation therapy. Thanks again Jade Bloom for another excellent product. I love all of these oils! Kit also comes with a spray bottle for oil misting. :) Supposed to have come with a recipe card, but I didn't see one, unless somehow it got thrown away with the packaging?? Great value purchasing in a boxed set. If you just want to try just one my fav is Citta-peppermint, cardamom, ginger & sweet fennel blend. This was a gift to my acupuncture Dr and she also instructs Yoga. She was thrilled with the set . She uses them during her acu appts and her yoga sets. Her favorite and mine is Savasana. This is a great deal. Not to mention, there is a synergy blend for every mood. I absolutely adore this kit. It has a beautiful presentation, and the glass spray bottle and recipe card are a nice bonus. You will not regret exploring this kit! You don't have to be a Yogi to use this! This will help anybody close thier eyes and take a moment to meditate and be mindful. By A purchase you won't regret. This is a lovely adorable box with JB's entire Yoga collection. It also includes a spray bottle and instructions for a mat or room spray. It's not just for the Yogi. These scents are great for meditating, and there is a blend for each mood. Very happy with my purchase. love all of these scents! just got into yoga so i cant speak on the affects of difussing while doing yoga. I tried one on its own and loved it so much I had to have them all. Not disappointed! I don’t know which one I like best. Too hard to choose; which means the box is the way to go. I waited until I could use my points and got a great deal! These all smell amazing! Definetly think it’s worth getting the full kit! Om: lemongrass with a hint of rosemary. As with all Jade Bloom oils, these oils are top quality. The price on this yoga oil kit can't be beat. Its such a good deal! I would recommend this yoga kit to anyone looking to enhance their yoga or meditation practice and take it to the next level. Just ordered the kit after receiving Namaste from a previous Collectors Club package and it was well worth it!! Super happy!! Great for personal use or to give as a gift! How clever Jade Bloom is for developing these signature scents that not only personify the way-of-life found in the yogi journey; but, for also creating scents that are of great use in everyday living. This is a wonderful kit for personal use; but, if you know someone who is into yoga, this would make a marvelous gift! Well done, again, Jade Bloom! I got this from the collectors club and I love the smell of it!! I purchased this kit to enhance my yoga practice. I was really surprised at how different all the blends smelled and how well they worked with their titles. Citta is my favorite of the bunch. It's very uplifting. The peppermint is rounded out nicely by the sage and other spicy notes. It's great to boost your workout. Namaste is a very grounding blend. The orange and camphor work together to produce a scent that reminds me of a very clean room. Ananda also has a citrus base, but is blended nicely with lavender. It's a calming but happy scent for sure. Om reminds me of my yoga studio. It's very earthy, with fir and rosemary being at the top of the ingredient list. You can definitely pick out the lemongrass as well, but it's not overpowering. This is my go-to for an evening meditation. Savasana is just as calming as you would expect it to be. I don't care too much for ylang ylang, but I do enjoy this blend. It's very nice diffused while I'm trying to sleep. All in all, this is an excellent kit for anyone who practices yoga, meditation, or mindfulness. Love the different smells! Very relaxing. I also use them during meditation and sometimes before bed. What an excellent mix! One for every occasion. I will be gifting this to a few of my Yogi friends this year for christmas!!! !